Chesco, our motorcycle sales consultant, is part of an initiative called “Partners for Possibility”. Partners for Possibility pair people in various industries with a school principal in an area closest to them and ensure that the participant is able to devote the required 10 to 15 hours per month as a thinking partner to the principal. Chesco is partnered with Trevor, principal of Merrydale Primary School in Mitchells Plain. Through his multiple visits to the school, Chesco not only has unique insight into the role that the principal needs to fulfill, but has also been privy to the challenges that the Trevor faces in his efforts to bring a level of excellence to the education & facilities on offer to the +/-1400 pupils. One of Trevor’s biggest concerns was the school library. Situated inside a container with all the shelving & and the desk made from recycled cardboard, the shelves and desk were starting to collapse under the weight of the books. In an attempt to “go green”, sponsors had kindly donated the library without realizing that it was not viable. 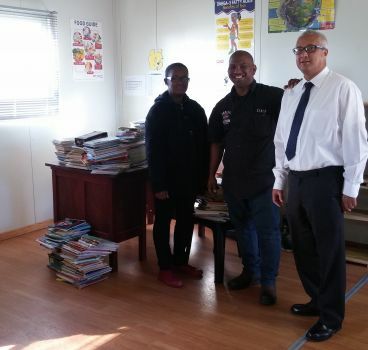 After Chesco met with Marc, Operations Director and Ash, Marketing Manager for H-D® Tyger Valley and presented the issues that the Merrydale library was facing, they put their heads together, found some shelving within the company that was not being fully utilized. They pledged to donate it as a replacement for the current shelving. An anonymous donor from the dealership also donated a sturdy, wooden desk for the library! Donating his time and ability, Chesco, along with Trevor and a few other Merrydale staff, ensured that the shelving was cleaned, painted and installed. Chesco also fetched and transported the desk to the school so that the librarian is able work without hassle. While this was an ongoing project for about 3 weeks, the aim was to have the shelving painted & desk ready on Mandela Day when the pupils returned from school holidays. Chesco & team put their backs into it and managed to completely transform the functionality & look of the library just in time! While the library is not fully complete, we were able to provide the shell in time for Mandela Day when the full staff complement returned and could help with re-packing the library. Greeted by a sea of smiling faces on July 18th 2016, the Vice Principal was able to break the news to all the pupils during assembly about the changes to the library! A HUGE thank-you to Trevor, Chesco, Partners for Possibility and everyone involved in allowing Harley-Davidson® Tyger Valley to give back in honour of Mandela Day. We look forward to hearing great things from the pupils of Merrydale Primary School!